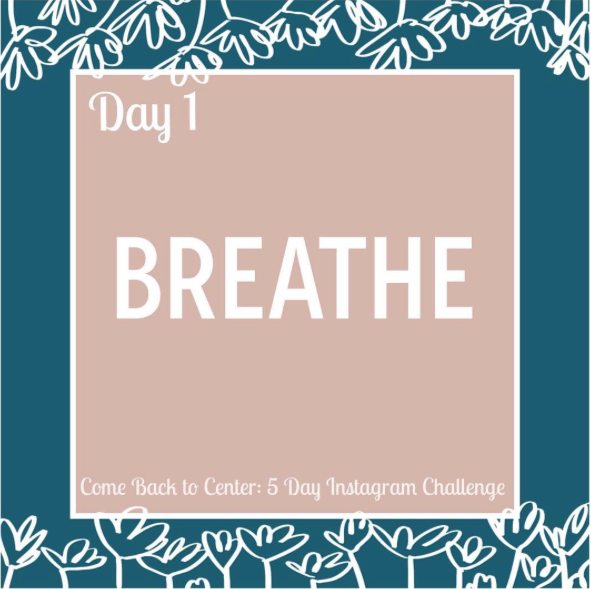 This is the first day of our 5 Day Instagram Challenge! If you haven’t already, you can join the challenge by following us on Instagram or by joining the Sweet Water Sisterhood Facebook group. 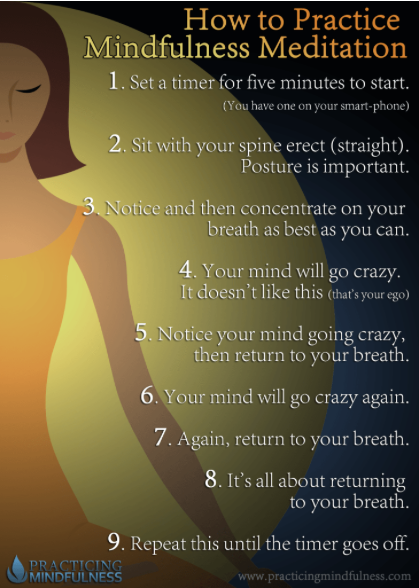 Today, your challenge is take 5- 30 minutes to breathe. I recommend a basic time of meditation or centering prayer, as the instructions are not complicated to follow. Check out the video below for simple instructions on Centering Prayer or read through the steps in the image to the right for how to do mindfulness meditation. The first time you do this, you may only be able to handle 5 or 10 minutes, but that’s still totally worth it! Breathing is something we do constantly; but when it is shallow, disordered, or even paradoxical breathing, it affects so much more than we realize. Our breathing usually changes in response to stress, and then we are left with tight muscles and increased feelings of anxiety. The way we breathe affects our digestion, our blood pressure, our heart rate, and even our brains. For your focused time of breathing today, I also highly recommend deep breathing, or what is often called belly breathing. You can read more here or watch for my video later today on Instagram! For more inspiration and ideas, check out the Sweet Water Offering Pinterest Board: Breathe. We are so excited that you’re here and taking this 5 Day Challenge with us. Please comment on the Instagram post if you do today’s challenge! A final note: It’s up to you how to do this week’s challenges. You can do them right away, do them later in the day, or make a plan for incorporating them into your day tomorrow. Depending on your schedule and personality, do what works best for you! If you’re interested in more support for Holistic Mental Health, check out this group coming up in March…A Little Space: From Sad and Stressed Out to Centered and Soulful.